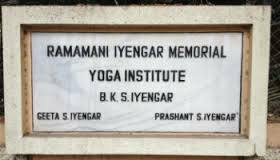 Unbelievably I am already 14 days into my month of study here, at the Ramamani Iyengar Memorial Yoga Institute. Where does the time go?! Every time I come, I think I am going write a prolific number of blog posts about my experience and then I sit down to write and…nothing. It’s so bizarre. Here I am, completely immersed in Yoga (between taking classes, observing classes, & self-practice, I quite literally feel like a sponge! ), yet it’s almost like I’m too deep in the vortex to really make sense of everything. At this point though, I know from my past trips that consolidating the lessons I’ve learned, translating them, internalizing them, and sharing them will inevitably be a slow and gradual process. That process will likely unravel over the course of many months (or longer!). While it will no doubt take time for the depth of the teaching to really penetrate, this trip, I’m making a concerted effort to at least document some of my observations and thoughts. I’m hoping that when I’m home working with and through the teachings, these observations will provide added context (and hopefully be of some interest to you folks 🙂 ). It is poignant when I observe the medical classes. I have always found the therapeutic applications of Iyengar Yoga inspiring. I love the problem-solving aspect of the work. How do I get ‘this body’ into ‘this shape’ to achieve ‘this goal’. Here though, because I am an observer, I don’t have access to the same background info I would have back home so I can only hypothesize as to what issues are being addressed. As a result, I’m less interested in the sequences (although some are obvious enough to follow) and instead I keenly watch how the senior teachers in the room work with their patients. I like to see how they use their hands (and feet, and elbows, and head! – I’ve noticed that they use their own bodies as a prop more often than we do at home.) They are incredible with their touch. To touch deliberately and at the same time delicately is such an art. Knowing when to touch, how much to touch, with how much intensity, etc…these are all things as yoga teachers we think about and explore. The senior teachers here are particularly gifted and it’s quite inspiring to watch them work. I have much to learn if I want my hands (and feet!) to develop further refinement and sensitivity. The vastness of Iyengar Yoga has also been apparent to me in the asana classes. The other day Simhasana was referred to as a ‘basic asana’ (whaaaat???) and in another class there were multiple asanas that I didn’t even recognize by name. Why didn’t I know their names, you ask? Because I had never done them before!! They were asanas that go beyond the various syllabi that us as Canadian teachers have been given to work from. This was a huge eye opener for me. It made me realize that I have a responsibility to my own practice that needn’t be confined by the various syllabi for assessment. And while as a more junior teacher I inherently knew that I needed to practice beyond the introductory syllabus, now because the syllabus I’m studying is itself quite challenging, I’ve had less impetus to look beyond it. This is something I need to keep in mind as I get back to my regular routine back home. In one of the classes last week, Sunita divided the class by age into 2 groups: 40 and under, and over 40. I was part of the younger group and I got to do a number of old school jumpings. Again, stuff I had never tried before. I jumped from Adho Mukha Svanasana through Lolasana into various forward extensions. I went from Eka Pada Sarvangasana directly to Supta Padangusthasana 1. I did Chakrasana. It was exhilarating! Sunita was clear – we are not to teach these jumpings/transitions unless we practice them ourselves and they are certainly not appropriate all of the time, but they do have their place. Again, the vast repertoire of Iyengar Yoga was reinforced. One of the very special things about being here is that I’m gifted with 2-3 hours of daily, dedicated (uninterrupted!) practice. It’s my opportunity to play with new ideas or techniques that have been taught in class and to work through my personal yoga needs. Although the yoga hall is generally quite crowded, the flip side is that there’s an amazing energy that comes from practicing amongst so many other dedicated practitioners. These practitioners come from around the world and it’s lovely to be reminded of the global impact of BKS Iyengar’s work. As I practice, I sometimes even catch a glimpse of someone else and think, oooh that would be cool to try (although sometimes, haha, I think the exact opposite). Regardless, there’s no question that the hall is filled with a vast range of practitioners – vast in age, ability, & culture, all united by their love for Iyengar Yoga and their reverence for Guruji, BKS Iyengar. It’s always a big deal to come here. I’m a long way from home and a lot of planning and coordination has gone into making this trip a reality. I’m feeling very grateful to have this opportunity and I already feel nurtured by the experience. It’s providing me with exactly what I had hoped – a solid dose of inspiration, motivation, & honest-to-goodness joy :). Thx Michael for sharing your thoughts and (as always!) for your support. Cheers! It was a pleasure to meet you at RIMYI. I’ve been an avid follower of your blog and hugely inspired by your story and reflections. Thank you. Beautifully written and full of golden nuggets, thank you Steph. I find classes diverse in ages and levels of experience inspire me both physically to challenge myself as well as spiritually. Challenges of any kind are good for the soul and body. My yoga goals are always to find the physical and spiritual challenge for the hour or so, thus achieving at least one of my daily tasks. Stephanie: Thank you for sending this on to me. Always glad to see what you are up to!! When will you be home????? I appreciated your lengthy and thoughtful review of your experience at the Institute. Thanks a lot, Stephanie. Has Your Yoga Practice Plateaued? Yoga Sequence vs Yoga Practice: Same Thing? Patti on Have You Elected a Yoga Governor? stephtenceryoga on Yoga Sequence vs Yoga Practice: Same Thing? Susan on Yoga Sequence vs Yoga Practice: Same Thing?